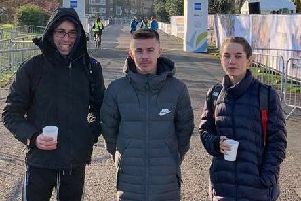 Two Hastings Athletic Club distance running talents achieved top 15 finishes at the National Cross-Country Championships. Lizzie Clarke came 11th in the under-20 ladies’ race and George Pool 14th in the under-17 men’s event at Harewood House, Leeds, on Saturday. The 18-year-old Clarke produced a good run to finish first in her year, which was bottom of the age group, in a time of 21 minutes and 44 seconds. Six days earlier Clarke clocked the fastest five-mile time in the country by an under-20 female this year as she finished first lady at the 10th Tenterden 5 Mile race. Pool was pleased with his run as he returned to form having been disappointed with his display in finishing second at Tenterden. The 17-year-old, who was sixth heading into the last lap, clocked 19:30. Three other Hastings AC members took part in a great day of racing over a tough course at a fantastic venue. Joe Body came 42nd in the under-20 men’s race in 30:39, Erika Body was 208th in the under-15 girls’ race in 18:23 and Russ Keen finished 1,014th in a 3,000-strong senior men’s field. Rhys Boorman, meanwhile, was the first Hastings AC athlete home in the Grand Brighton Half on Sunday. Boorman came 24th out of nearly 7,400 finishers in 73 minutes and 42 seconds. Although his third fastest time over the distance, Boorman was still disappointed with it. He said: “I’d hoped to have been faster, but struggled with the heat in the second half of the race. Ben McCallion clocked 1:22.39, Ross Garnett knocked around 10 minutes off his PB in 1:33.34 and Jenna French ran 1:31.27. Several Hastings AC members took part in The Gunpowder Run in Battle, an approximately 8km route along the challenging Gunpowder Fields before finishing in front of Battle Abbey. Barry Buchanan came second overall in 28:53 having led almost all the way only to be pipped at the finish. Fifteen-year-old Shannon Hopkins-Parry was first lady - and sixth overall - in 33:33. Terry Puxty clocked 35:11, John Waterhouse 44:33, Jason Johnstone 43:37, Amy Rodway 39:20, Rosy Clements 40:05, Kate Barlow 40:49 and Abby Kirsopp 41:52. Sixteen-year-old prospect Isaac Elam smashed his personal best with a time of 16:35 to win the latest weekly Hastings parkrun seafront 5k race on Saturday morning. Ethan Hodges was second.